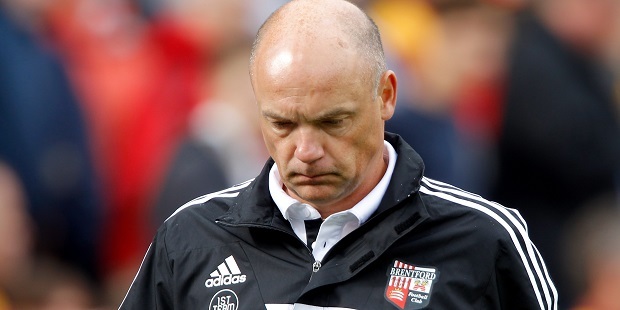 Brentford found themselves on the end of a thrashing after goalkeeper David Button’s first-half sending-off. Button was red-carded following a 26th-minute challenge on Bradford forward Nahki Wells just outside the penalty box. Stand-in keeper Jack Bonham then endured a torrid afternoon, picking the ball out of the net four times as the visitors were overrun. Bonham was signed by Brentford during the summer after his errors after coming off the bench on the final day of last season cost his previous club Watford promotion to the Premier League. And the 19-year-old’s confidence will hardly have been helped by another shaky display in the second league appearance of his fledgling career. James Hanson opened the scoring four minutes before the interval when he slotted home after being set up by James Meredith. Hanson hit the bar before three goals in eight second-half minutes put the match well beyond Brentford’s reach. With Tony Craig trying to keep up with the dangerous Wells as they chased a long ball, Bonham’s decision to race from his line proved to be the wrong one as the under-pressure Bees defender inadvertently headed past him, giving Wells a simple tap-in. Garry Thompson’s far-post header from Meredith’s cross made it 3-0 and when Bonham was unable to claim Kyel Reid’s corner, Hanson pounced to score his second of the game. Bonham, to his credit, then showed his talent by producing a fine save to deny Alan Connell. And Brentford persevered until the end, almost pulling a goal back through Clayton Donaldson and again when Jake Reeves’ free-kick deflected off Bantams defender Andrew Davies and onto the bar. Button’s controversial dismissal was undoubtedly the turning point, as up until that point the visitors looked the more likely team to go ahead. Their on-loan Chelsea midfielder George Saville had an early effort blocked by Davies and Harlee Dean fired over as Uwe Rosler’s side looked sharp in the opening stages. When Marcello Trotta, making his first appearance since returning from Fulham on loan, had a shot tipped against the outside of the post by keeper Jon McLaughlin, Brentford seemed to be turning the screw. But they lost the initiative when Button felled Wells and referee Andy Haines consulted his assistant before pulling out the red card. Brentford: Button, Logan, O’Connor, Dean, Craig, Forshaw, Saville (Dallas 68), Reeves, Fillo, Donaldson, Trotta (Bonham 27). Subs not used: Venta, Nugent, Saunders, Diagouraga, El Alagui.